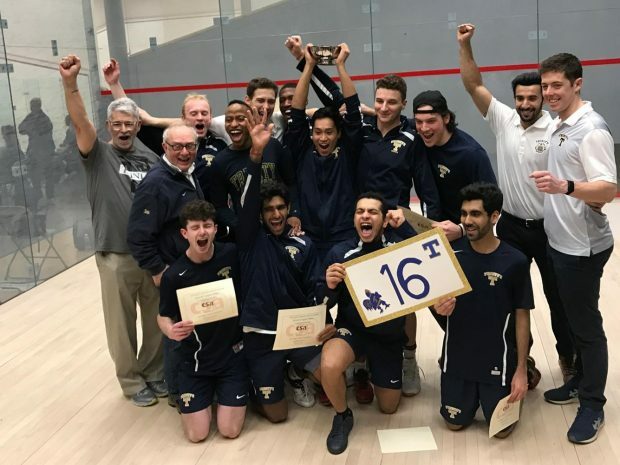 While many students were enjoying a short break for Trinity Days, Men’s Squash was busy winning a national championship. The top seeded Bantams went into Harvard looking for the program’s 16th CSA National Title. In the quarterfinals, Trinity dominated the University of Pennsylvania by a score of 8-1. The top eight for the Bantams all did their jobs and pushed the team through to the semifinals. James Evans ’18 lost the first game of his match, but came back to win 3-1, continuing his incredible undefeated streak in college squash. In the semifinals, Trinity had a rematch from Senior Day against the St. Lawrence Saints. The Bantams beat the Saints by a commanding 7-2 score. The Bantam’s depth took charge in this matchup, with the numbers six through nine all taking care of business, along with Kush Kumar ’20 in the top spot, and Thoboki Mohohlo ’19 and Michael Craig ’19 in the three and four spots respectively. In the finals, the Bantams faced off against the #2 ranked Harvard Crimson. Trinity recently defeated the Crimson in Cambridge, and looked to repeat that score line in the championship match. After the first wave of matches, the Bantams were behind 2-1, with Mohohlo picking up the lone point of the wave. However, after a second wave sweep courtesy of Rick Penders ’18, Tom De Mulder ’19 and James Evans ’18, Trinity needed only one victory out of the final wave to be crowned national champions. The Crimson won matches in the one and seven spots, but Michael Craig defeated Timothy Brownell of Harvard to bring the CSA National Championship back to Hartford for an incredible 16th time! Patrick O’Sullivan ’20 said “this was the biggest moment of his squash career,” and watching Michael Craig finish the job with his teammates “was a fitting end to quite an emotional season.” That emotion was on full display as the Bantams rushed the court, some crying tears of incredible joy. Trinity as a whole is thrilled to have the CSA Trophy back in its rightful home!